1. Circuitry for cone signals. Cone photoreceptors are the sensors of bright light and different wavelengths of light in the retina. They are sensitive in photopic (bright light) conditions and come in several types according to the structure of the visual pigments or opsins in their outer segment regions. In dichromatic animal species there are two types of visual pigments in two types of cone (most mammals). Cones sensitive to blue light and cones sensitive to red-green light. In trichromatic animal species (some primates and man) there are three types of cone according to their visual pigments (see chapter on photoreceptors). These are long wavelength (red), medium wavelength (green) and short wavelength (blue) sensitive cones. 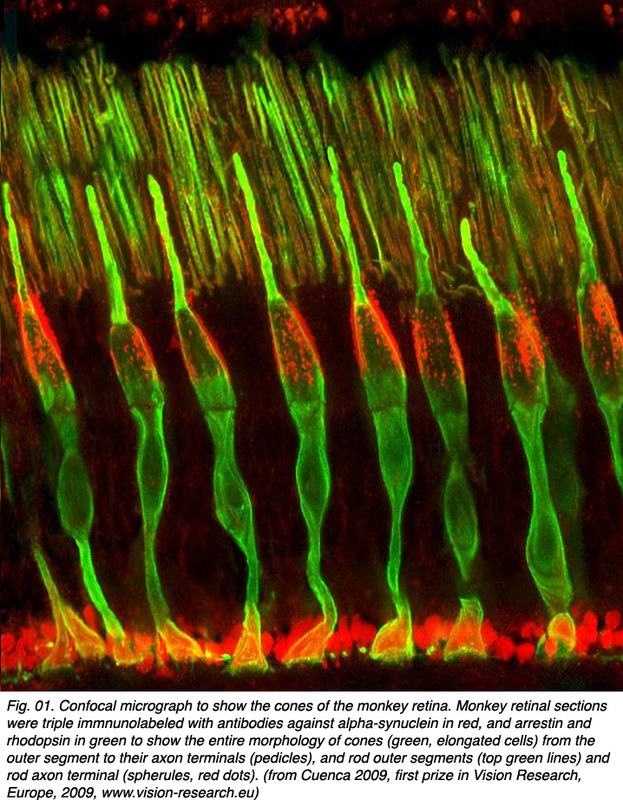 Figure 01 shows cone photoreceptors stained throughout with an antibody to alpha-synuclein and arrestin so they clearly visible in section of the monkey retina (courtesy of Professor Nicolas Cuenca, University of Alicante, Spain). The circuitry whereby cone signals pass through the retina to the ganglion cells is rather different from that of the rod pathways. The first difference is at the outer plexiform layer. 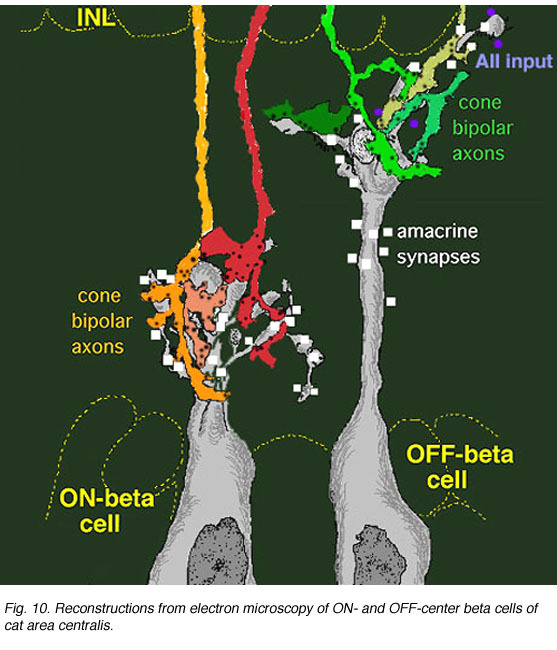 The cones synapse upon various cone bipolar types rather than on a single type like the rod system Fig. 02. Thus at the outer plexiform layer a choice of pathways is already installed for the cone system. As we have already mentioned (section on the OPL), cone bipolars come in varieties distinguished by the size of their dendritic field (midget, diffuse, and large-field diffuse, Fig. 02) and by their different types of synaptic contact with the cone pedicles i.e. invaginating-ribbon synapses (imb), flat or basal junctions (fmb) or non-ribbon related basal junctions (Fig. 1). Vertebrate photoreceptors are in a depolarized state in darkness and are hyperpolarized by light (Trifonov, 1968). Thus it is thought that the neurotransmitter glutamate is released continuously in the dark and is suppressed by light. 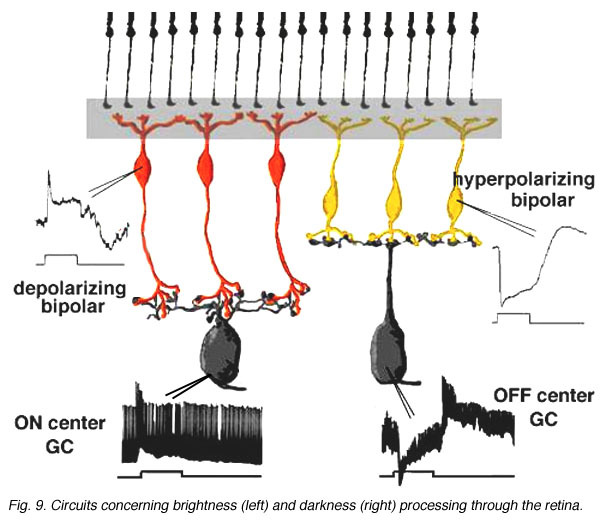 We also know that bipolar cells respond to light either with a depolarization or a hyperpolarization to a light stimulus (Werblin and Dowling, 1969; Kaneko, 1970). 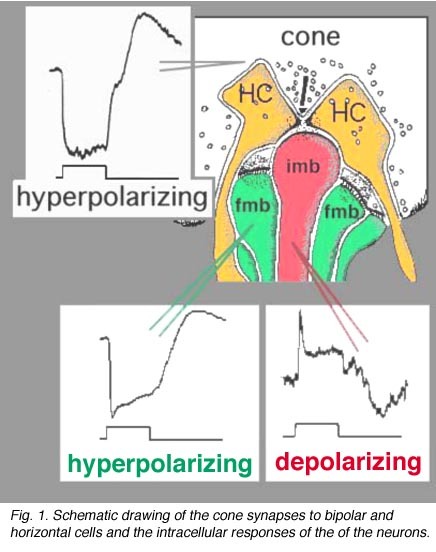 As we saw in the rod pathway chapter, rod bipolar cells have a depolarizing response to light (Dacheux and Raviola, 1986) but cone bipolar cells can be either hyperpolarizing or depolarizing to light (Nelson and Kolb, 1983). Now, we know that the cone bipolar types that make central ribbon contacts (Fig. 1, imb) will be ON-center (center-depolarizing) types (ON BC), while cone bipolar cells that make wide-cleft basal junctions (Fig. 1, fmb) will respond to light like the photoreceptor itself, i.e. will be OFF-center (center-hyperpolarizing) types (Nelson and Kolb, 1983) as suggested originally by Raviola and Gilula (1975). Different glutamate receptor types appear on depolarizing (ON-center) and hyperpolarizing (OFF-center) bipolar cells (Fig. 2) (Miller and Slaughter, 1986). 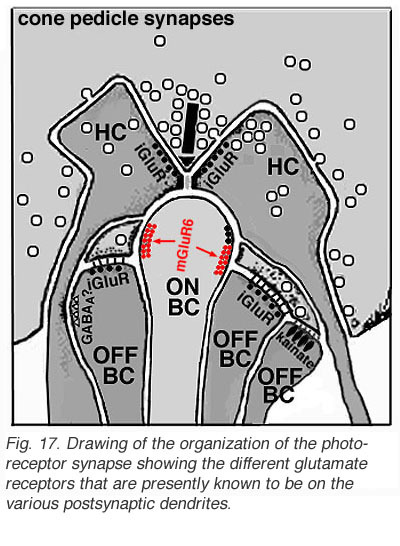 The ON or OFF center synapse is determined by the nature of the postsynaptic receptors to glutamate at the bipolar cell dendritic contacts with the cone. The OFF-bipolar receptor appears to be related to the AMPA-kainate type and so is a common, excitatory, ionotropic glutamate receptor (Fig. 2, iGluR) and some are specifically kainate receptors (Fig, 2, kainate). In contrast the ON-type bipolar cells have metabotropic receptors (mGluR) that bind selectively the glutamate agonist APB (or AP4, 2-amino-4-phosphonobutyrate). 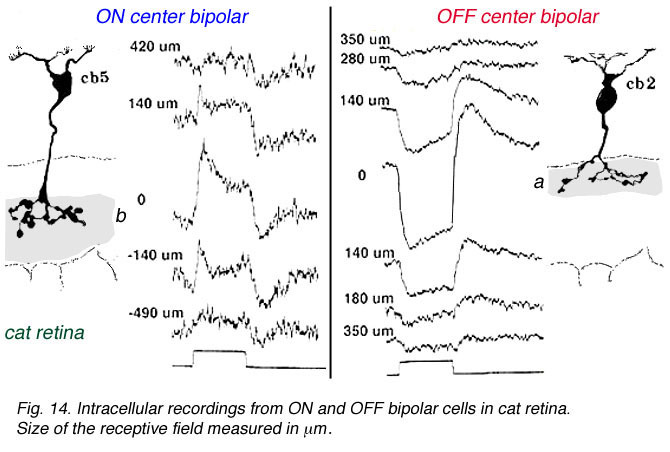 Application of APB selectively hyperpolarizes their membrane potentials and suppress the light-responses of ON-center bipolar cells (Slaughter and Miller, 1981; Nawy and Copenhagen, 1987). The receptor at the ON-bipolar cell is now thought to be mGluR6 (Fig. 2, red symbols) (Numura et al. 1994; Vardi et al. 1997). Receptor-activated G-proteins, originally thought to mimic the cyclic-GMP cascade occurring in photoreceptors are the underlying mechanism of transduction in ON-center bipolar cells (Nawy and Jahr, 1990; Shiells and Falk, 1990). Most recently, good evidence has been provided for a subunit of the transducin molecule, GalphaO, to be the second messenger in the ON-center bipolar cell activation pathway (Nawy, 1999; Dhingra et al. 2000). See more detailed descriptions in the chapter on bipolar cells pathways by Connaughton and Nelson, webvision. Some years ago it was demonstrated by electron microscopy and 3-D reconstruction of cone bipolar profiles in the inner plexiform layer of the cat retina, that these bipolar axons make most of their ribbon output synapses to ganglion cell dendrites (Fig. 3) (Kolb, 1979). Bipolar cell axons that terminated in sublamina a of the inner plexiform layer (closer to the amacrine cell bodies) made ribbon synapses exclusively with dendrites of ganglion cells that had dendrites in this sublamina (Fig. 4). In fact, such bipolar cell axons did not even reach down far enough to contact ganglion cells in sublamina b of the IPL. 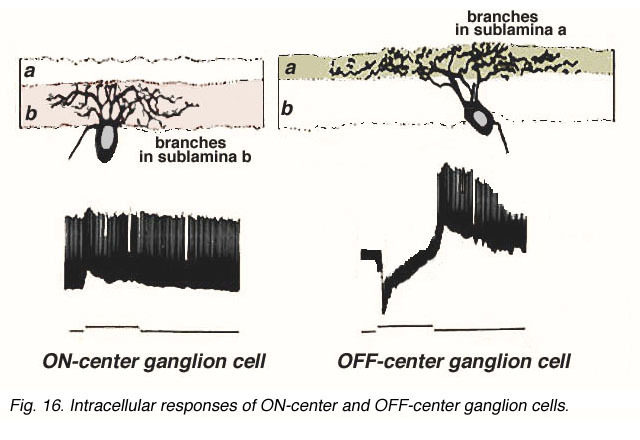 The ganglion cells branching in sublamina a were known from Nelson and coworkers findings (Nelson et al., 1978) to give OFF-center responses to light flashes. 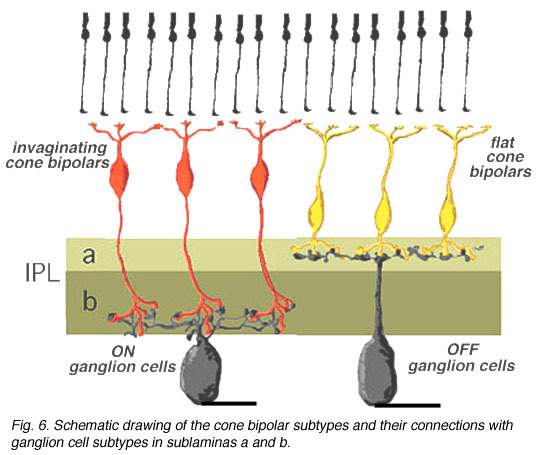 Conversely the cone bipolar cells with axons in sublamina b of the inner plexiform layer (closer to the ganglion cell bodies) made ribbon synapses only upon the dendrites of ganglion cells that branch in sublamina b (Fig. 4). Again, Nelson et al. (1978) had shown that such ganglion cells were ON-center in response to light flashes. Thus the cone bipolar response type (either ON or OFF center) drives specifically its ON or OFF center ganglion cell segregated to the two sublaminae (b and a respectively (Fig. 4). Figure 5 (below) shows the branching levels and the ON and OFF spiking responses of intracellularly-recorded and HRP stained ganglion cells in cat retina. The animation further illustrates the differences in morphology and corresponding light responses. In the human retina the common cone bipolar cells are, like the cat, classified not only by the nature of their synapses with cone pedicles, but also by which sublamina of the IPL their axons terminate in. Thus, some of the cone bipolar types send axons to sublamina a (fb types) and others to sublamina b (ib types) of the IPL. 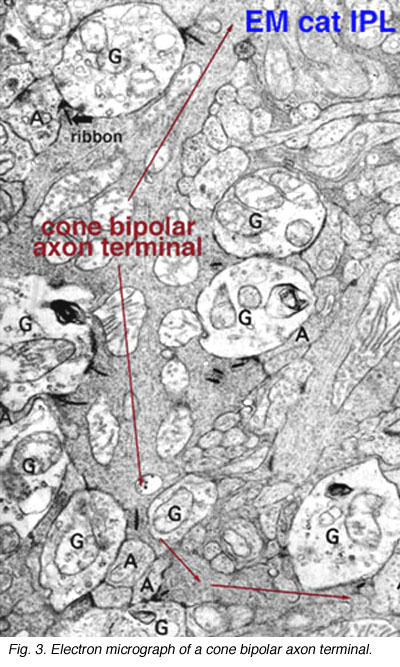 We expect that like the cat, human cone bipolar cells with axons in sublamina a will connect to OFF-center (center-hyperpolarizing) ganglion cells and bipolar cells with axons in sublamina b will connect to ON-center (center-depolarizing) ganglion cells (Fig. 6). Fig. 6. Summary schematic drawing of the two cone bipolar subtypes (invaginating and flat) and their connectivity with ON and OFF center ganglion cells. 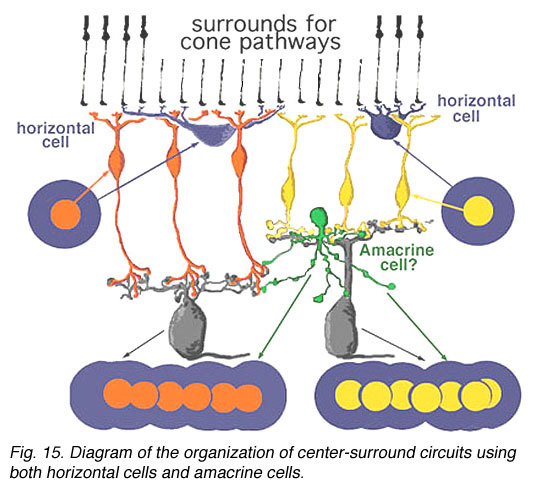 Thus a major difference in the circuitry of the cone compared the rod pathways in the mammalian retina is that cone bipolar cells make direct synapses with ganglion cell dendrites, without the need for intermediate amacrine cell circuitry as occurs in the rod pathway (see previous chapter). The cone pathways are, therefore, both more direct and more narrow-field and convergent than the rod pathways. 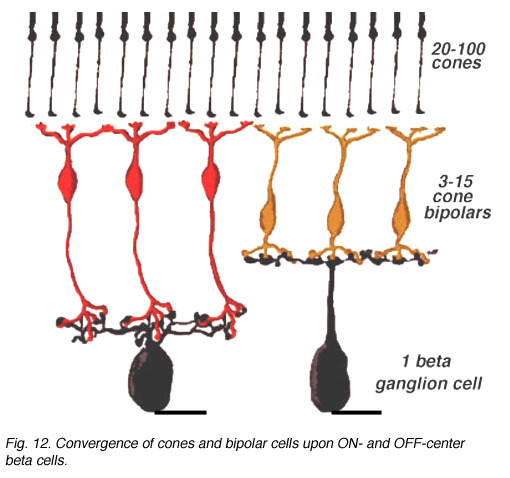 Fewer cones converge onto cone bipolars than rod to rod bipolars and then only a relatively small number of cone bipolar cells converge onto their ganglion cells (Fig. 7). The ultimate in low convergence ratio is the midget system in the human and primate retina, which we shall deal with separately in another chapter. 2. Cone pathways mediate successive contrast (ON and OFF pathways). Cone pathways in mammalian and human retinas run as two parallel streams of information directly from the cone photoreceptor to the ganglion cell through the straight pipe-line, the cone bipolar cell. What is the reason for two parallel channels for the cone system when the rod system had only one? 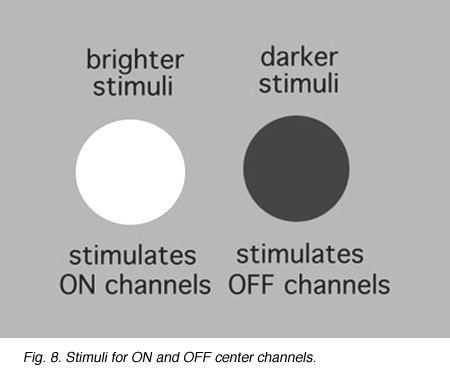 The answer is that this organization allows one channel to provide information to the ganglion cell concerning brighter than background stimuli (the ON-center channel) and the other, darker than background stimuli (the OFF-center channel) (Fig. 8) as first demonstrated by Kuffler in 1953 from recordings of ganglion cells in the cat retina. As we have seen above the anatomical substrate for the origins of these two important ON-center and OFF-center channels in the bipolar cell is the types of synaptic contacts cone bipolar cells make with cone pedicles and their specifically different layered contacts with their partner ganglion cells. The complete circuit to carry the message concerning brightness and darkness through the retina in the cat is shown below (Fig. 9 and the movie). 3. Cone pathway circuits mediate simultaneous contrast (center-surround receptive fields). Information concerning the overall brightness or darkness of the image is of primary importance for visual sensation, but putting these two informations in simultaneous contrast to each other greatly improves the resolution of the image (Fig. 10). Simultaneous contrast is achieved by lateral inhibition where a dark boundary inhibits a light area or vice versa. 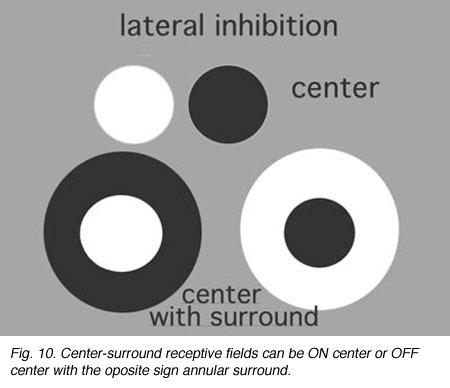 In the retina, an important finding by Hartline (1940) from frog optic nerve recordings first described retinal ganglion cell receptive fields as concentric with a response of opposite sign to the center found in the surround of their receptive field. It is thought that horizontal cells at the OPL provide, through a mechanism of lateral inhibition, a surround arranged around the receptive field center of firstly the photoreceptor itself and then the bipolar cell contacting the photoreceptor (Werblin and Dowling, 1969; Baylor et al., 1971; Kaneko, 1970). The wiring responsible appears to start at the small local circuit we saw in the cone triads at the ribbon synapses (Fig. 11) (see chapter on the outer plexiform layer). Fig. 11. Electron micrograph of a cone triad showing the horizontal cell dendrites (HC) which are postsynaptic to the cone (and might form feedback synapses to the cone) and the two major postsynaptic bipolar cell dendrites (IB and FB). 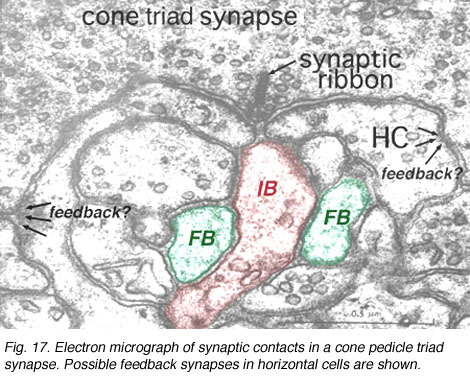 Thus, the negative feedback synapse of the horizontal cell to the cone photoreceptor at the ribbon triad synapse allows the larger receptive field of the horizontal cell network (horizontal cells are coupled in a syncytium across the retina by electrical synapses between neighboring cells) to provide a surround to the narrow central cone response (Werblin and Dowling, 1969; Naka, 1976). This concentric organization is then transmitted to the bipolar cells making contact with the cone (Werblin and Dowling, 1969; Kaneko, 1970; Toyoda, 1972) and thence to the ganglion cell that the cone bipolar cells contact. Figure 12 below summarizes the architecture for center surround organization by means of horizontal cell to cone bipolar cell circuits in the cone bipolar system of the mammalian retina. The center pathway is created by the cone to bipolar to ganglion cell through-channel, while the injection of horizontal cell information provides an antagonistic surround to the center: an OFF-surround for the ON-center channel (horizontal cell and orange bipolar, left hand pathway) and an ON-surround for the OFF-center channel (horizontal cell and yellow bipolar, right hand pathway (Werblin and Dowling, 1979; Werblin, 1991). In mammalian retinas, surround responses are not as strong a component of bipolar cell receptive field as they are in cold-blooded vertebrate bipolars (Nelson and Kolb, 1983). 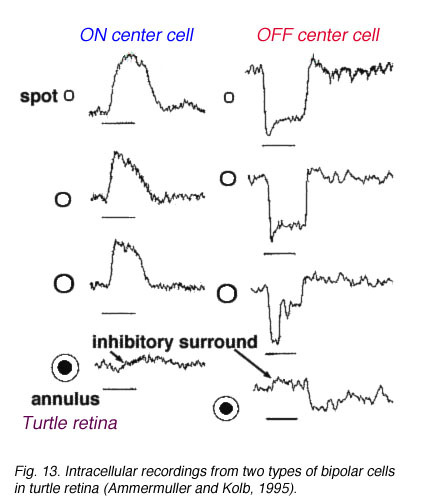 Compare for instance the bipolar responses from a Turtle retina (Ammermüller and Kolb, 1995) with those of a cat retina (Nelson and Kolb, 1983) in Figures 13 and 14, below. We know from intracellular and extracellular recordings of cat and monkey ganglion cells (Enroth-Cugell and Robson, 1966; Kuffler, 1953; Levick, and Thibos, 1983; Gouras, 1968; Shapley and Perry, 1986) that the commonest mammalian ganglion cells have a strong center surround organization. Thus, it is possible that additional surround antagonism to the bipolar driven center response of a ganglion cell, is constructed by certain, as yet not fully understood, amacrine cell networks in the inner plexiform layer (Fig. 15) (Lebedev and Marshak, 2007). Hartline HK. The receptive fields of optic nerve fibers. Am J Physiol. 1940;130:690–699. Levick WR, Thibos LN. Receptive fields of cat ganglion cells:classification and construction. Prog Ret Res. 1983;2:267–320. Miller RF, Slaughter MM. Excitatory amino acid receptors of the retina: Diversity and subtype and conductive mechanisms. Trends Neurosci. 1986;9:211–213. Naka K-I. Neuronal circuitry in the catfish retina. Invest. Ophthal. 1976;15:926–935. Nelson R, Famiglietti EV, Kolb H. Intracellular staining reveals different levels of stratification for on-center and off-center ganglion cells in the cat retina. J Neurophysiol. 1978;41:427–483. Toyoda J-I. Membrane resistance changes underlying the bipolar cell response in the carp retina. Vision Res. 1972;12:283–294. Trifonov YA. Study of synaptic transmission between the photoreceptor and the horizontal cell using electrical stimulation of the retina. Biofizika.1968;10:673–680.